Rogue Springers off to Good Start! The Rogue River in Southern Oregon is famous for its run of springers. In recent years returns have been low. However, 2015 is off to one of the fastest starts in recent history. Typically, our spring salmon don’t start showing in the Upper Rogue until at least the first week of May. 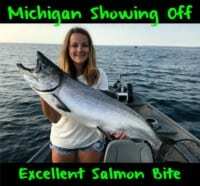 This year, meanwhile, we switched over to them from winter steelhead on April 15th and have been catching fish every day since. Like the rest of the Northwest, we are seeing drought conditions, too. The early run of springers is in large part due to the extremely low and warm flows we’ve had. We’ll have to wait and see if the huge early return of fish is a sign of a large return, or an early run. In the meantime we are taking full advantage of all the fish that have already made their way to the Upper Rogue. Our springers are much larger on average than those that return to the Columbia system. Hatchery fish average 14 to 20 pounds with fish up to 35 pounds caught every year. Our wild fish tend to be slightly larger and average 15-25 pounds with fish up to 45. Our run is typically a 50/50 mix of hatchery and wild springers. 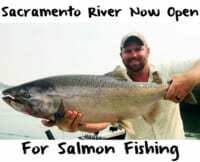 The limit is two hatchery salmon, per angler, per day. The Upper Rogue is mainly an egg and plug fishery. The springers stack up in the deep holes, and we target them mostly by back bouncing eggs. My back bouncing setup consists of 65-pound braided mainline to a three-way swivel to 20-pound leader and a double hook setup. You’ll also want a rod that is sensitive enough to feel your weight tap bottom, while also having enough backbone for a good hookset and to be able to turn a large king in fast current. It’s always a good idea to have divers and large KwikFish in your arsenal as well. Those are good for days when they want something a little different. With the low water most people have been downsizing their baits. On the other hand, I’ve been upsizing. I’ve been using red Fire Cured eggs, and cutting them into roughly half-dollar sized chunks. The springers have been sitting in heavy current areas and these baits withstand the beating they take, and also put out a ton of scent into the water. So far the fish haven’t been scared off by the size of the bait. I also like to add Fire Power (powdered krill) when curing my eggs, and either live sand shrimp, canned tuna, or a chunk of sardine to my baits. This adds extra scent and helps entice more bites. Our run of springers extends until July 31st. We receive fresh fish almost daily until it closes. The end of May and early June is the typical peak of the run, and I can’t wait to see what happens the rest of the season with this huge early start. Editor’s Note: Steven Theel operates S.O. Chrome Guide Service. 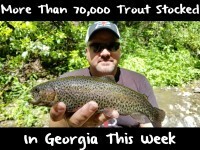 For more info on his Upper Rogue springer trips please visit http://so-chrome.com.